As the dust settles on the close of the 2017 legislative session, it’s a great time to look back and see what was accomplished in our fight to defend the Second Amendment here in Iowa. Obviously, we completed a six-year battle to pass Stand-Your-Ground law and a whole lot more — but that didn’t just happen on its own! In this three part series, we’re going to review the 2017 session and see how we can use these lessons as we push for Constitutional Carry in 2018. While the start date of the 2017 legislative session may have been January 9, this year’s fight to pass Stand-Your-Ground law really began when the 2016 session ended, on April 29, 2016. 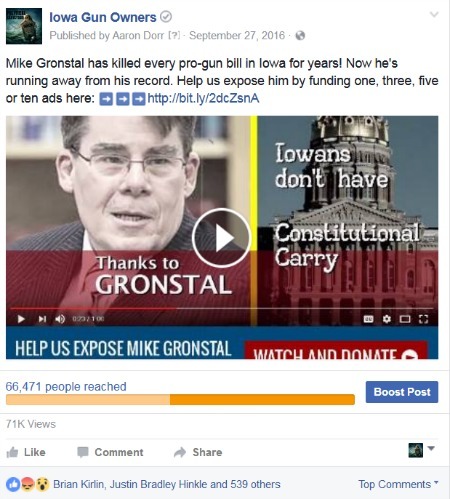 That was the date when then-Senate Majority Leader Mike Gronstal killed Stand-Your-Ground law for the year, and it was the date that Iowa Gun Owners began to lay out our program for the fall elections. As a 501c4 non-profit, we can not expressly advocate for or against candidates. But we are able to advocate for the Second Amendment and to expose legislators who oppose it. And there’s no better time to do that than in the months leading up to a major election. And I have to tell you, we love getting out into these districts and making anti-gunners pay a political price for their behavior in Des Moines. It’s essential that we do, or anti-gun legislators will just do it again next year as they’ve been doing for years. And why wouldn’t they, as they knew that there was no state organization who would hold them accountable for opposing the Second Amendment. No Deals and No Games! That all began to change with the 2010 elections when gun owners in Iowa, educated by Iowa Gun Owners, booted out an incredible twenty three anti-gun incumbents. In 2012 and 2014, gun owners again made their frustrations felt by booting out incumbents — from both parties — who were opposing the Second Amendment or who sponsored gun control legislation. So as the 2016 session began to wind down, Gronstal and Sodders knew that they had to pass something that could pass for a gun bill — to try to placate the gun owners that they knew would be waiting for them in the fall. First they tried to buy your silence by legalizing suppressors in exchange for killing Stand-Your-Ground and Constitutional Carry. Once we let them know that wasn’t good enough, they then legalized carrying pistols on ATV’s and snowmobiles with a triple retention holster. While these were some steps forward, only made possible by IGO supporters who were demanding bigger bills, they were gimmicks designed to silence gun owners in the fall. We wanted and demanded passage of Stand-Your-Ground and Constitutional Carry legislation, and we were going to hold them accountable if they didn’t deliver. And that’s what makes Iowa Gun Owners so effective and so different from any other organization in Iowa. We don’t care what politicians think about us. We don’t care if they attack us in the paper, on their little Facebook page, or on the floor of the Iowa legislature –- we’re not going to back down. More, we’re going to attack them back as hard as we can. So instead of falling for the gimmicks they offered up, we prepared for the largest election program in our existence once the gavel fell for the last time during the 2016 session. After running our candidate survey program in the summer months where we identified who was willing to publicly support your gun rights and who was not -– it was time to get to work. With early voting capturing a larger than ever percentage of the vote here in Iowa, we had to be ready earlier than ever before. 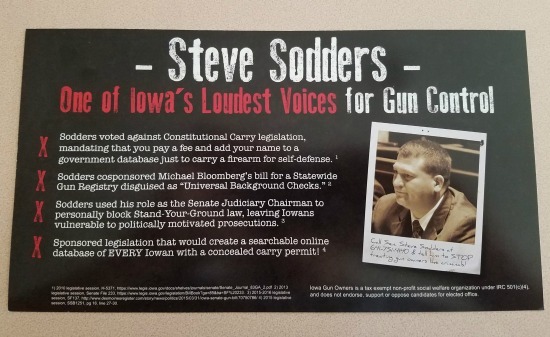 By late September Iowa Gun Owners was sending out direct mail by the truck load, letting gun owners in key districts know exactly who was responsible for Stand-Your-Ground law’s defeat. And this was a focused plan. We’re not in the business of wasting your donor support in areas where pro-gun candidates have no chance of being successful. Rather, we lasered in on key races where we knew we could be effective. Specifically, we hammered on Mike Gronstal, Steve Sodders, Mary Jo Wlilhelm, and Brian Schoenjahn’s districts. With direct mail rolling out by the tens of thousands of pieces, we added in an additional layer of mail to combat the blatant lies that incumbents were publishing about their records. These ‘slicks’ were the hardest hitting pieces we could design, intending to make sure that every gun owner in our targeted districts knew the truth about their legislator’s stance on the Second Amendment. The feedback on this program was incredible, as we were able to put a face on the gun control movement in Des Moines and give people a way to express their frustration with out-of-touch legislators who were blocking pro-gun bills. And of course, we had to combat the spin and misinformation that Sodders and others were putting out over the airwaves. While we could never match their anti-gun campaign dollar for dollar, we knew we had to do what we could. Soon radio and TV ads like this, this, and this were running all over the state. Having paid for the production of these ads, we got double the use out of them by using them in a state of the art internet and Facebook program, that reached out to hundreds of thousands of additional Iowans. We’re not armchair gun rights activists, we love to get out there and meet with gun owners one on one and tell them the truth about anti-gun incumbents first hand. And so with our mail and ‘slicks’ blanketing these districts –- being augmented by our radio and TV ads and digital campaign -– we unveiled a door to door ground game as well. 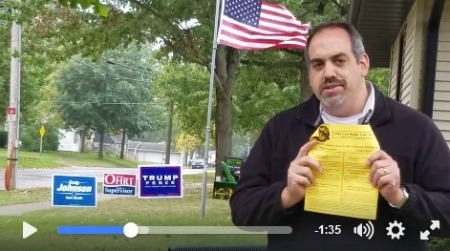 In the 6 weekends prior to election day last fall, Iowa Gun Owners volunteers put our hard-hitting flyers on a combined 25,000 doors in Senate Districts 8, 26, 32, and 36! We were in big towns like Council Bluffs and Marshalltown, but also in small towns like Lawler and Stanley. And let me tell you, while it may be the most ‘boring’ part of our program, nothing beats going door-to-door for effectiveness! We had people flagging us down all over town letting us know that that were getting our mail and ‘slicks,’ and that they were hearing the radio and TV ads — and that they would be voting pro-gun on November 8. Making Them Pay A Price! By now you know that this program was wildly successful in educating gun owners who wiped out not only Mike Gronstal and Steve Sodders, but also Senators Wilhelm, Schoenjahn, Brase and Courtney! All in all, this program cost right at $150,000 to implement — every single penny of which was funded by grassroots gun owners in Iowa! The Senate Majority Leader, Mike Gronstal, toppled. A hostile Judiciary Chairman and Senate President Pro-Tem, Steve Sodders, booted out! Multiple rank and file incumbents, with over a dozen years of time in the legislature fighting against the Second Amendment, were sent home. The result of these efforts led to a flip in the Iowa State Senate and, with it, a pro-gun majority in all three chambers of state government for the first time in almost two decades! 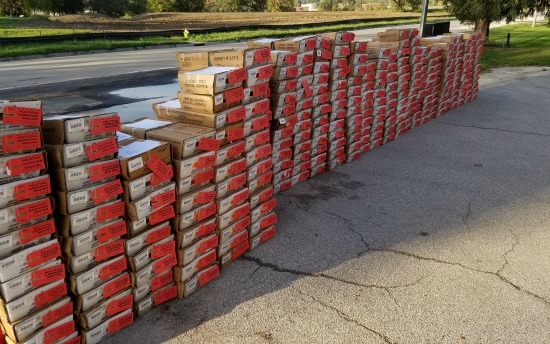 None of this would have been possible without the humbling generosity of thousands of gun owners here in Iowa. It wouldn’t have been possible if Iowa Gun Owners had a philosophy of appeasement with anti-gun politicians like so many other organizations do. And it wouldn’t have happened had we been willing to take the scraps of freedom that the anti-gun Senate offered up — in exchange for our silence. This has been the fundamental difference between Iowa Gun Owners and any other lobby organization in Des Moines. Rather than be party to watering down and weakening our bill, we’re willing, eager in fact, to get out into the districts of these anti-gunners and expose them at election time. And in the process, the entire gun rights debate in Iowa shifted. With dozens of anti-gun incumbents being removed from office as a result of these programs, gun grabbers in Iowa now know that they have nowhere to hide. So with the anti-gun Senate caucus having been decimated in the elections and the remaining members running scared, gun owners were in an excellent position to pass Stand-Your-Ground before the 2017 session was even gaveled in. In our next update, we’ll cover the introduction of Stand-Your-Ground legislation and how the Iowa House — under the leadership of Speaker Pro-Tem Matt Windschitl — almost gutted this legislation until gun owners intervened. P.S. This is the first in our session-in-review series that will cover how Iowa Gun Owners, backed by hundreds of thousands of grassroots gun owners, passed Stand-Your-Ground law in 2017. Stay tuned for the next part in our series which will be coming out shortly.